It seemed that we had been looking forward to our Goat Rocks Wilderness trip all summer long, and finally (finally!) our September vacation time was upon us. Limited only to what we could carry in our backpacks, packing for a week long trip deep into the wilderness takes a little more planning than for a one or two night trip. Weighing in at 70 and 35 pounds a piece, it’s pretty obvious here that the bigger one is Kent’s. 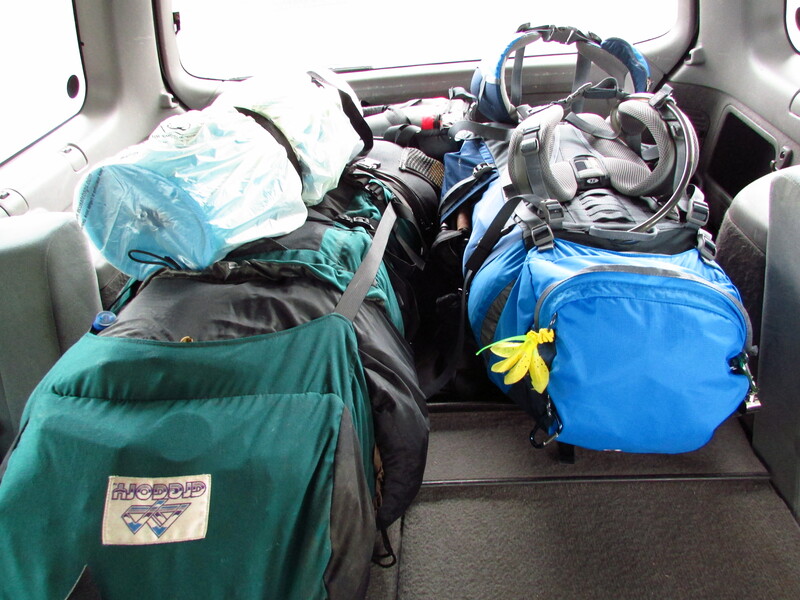 He carries all the gear – the tent, tarps, ropes, stove, fuel, food (lots of food for a week long trip I might add!) cook pans and so much more. Me, well, there is just no way that I could carry a pack with all that in it, but I do manage to carry all my own personal gear – like two to three liters of water in my hydration unit and my clothes, sleeping bag, air mattress, camera gear and such. The drive from home to the Snowgrass Flats trailhead in the Goat Rocks Wilderness took about 4-1/2 hours, and we ate lunch at the car before booting up. 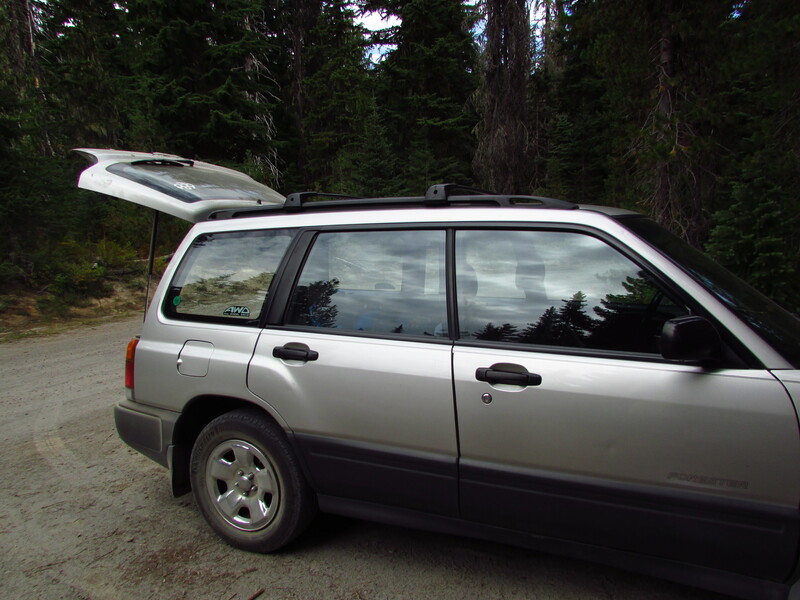 Having recently upgraded the old Volvo wagon for this higher clearance Subaru Forester, it did seem easier to make the drive up the gravel logging road in order to reach our trail. 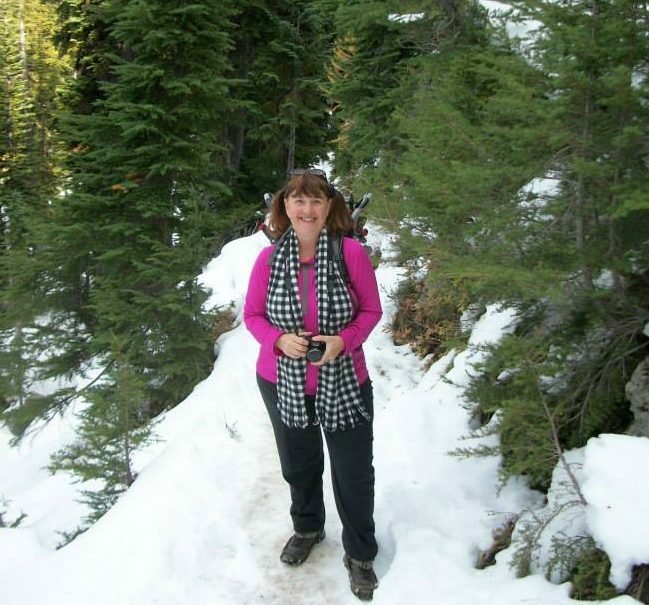 Here we are at the Snowgrass Trailhead, well fed, booted up, packs on – and ready to head into the wilderness. All along our hike from the trailhead to Snowgrass Flats, the trail was in very good repair. A close look at this photo shows how the trail over this stream has been previously washed out and built back up again. As it turned out, unfortunately, two days later, flash floods wiped out all that solid-looking construction and we found ourselves wading through a very fast flowing stream with water well over the tops of our boots in order to make the hike out. Stay tuned, you can read more about that in a future post! 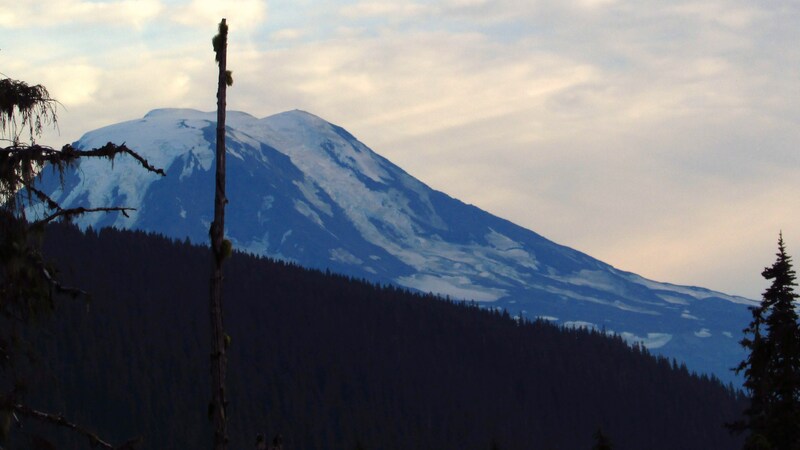 Even with the clouds of a coming storm sometimes looming above us as we hiked, we had a wonderful view of Mount Adams from the trail. Here’s Kent, making the final stream crossing into Snowgrass Flats. Since the logs of this make-shift bridge were wobbly, he first took his pack over, came back for mine, and then gave me a hand as I crossed. This bridge was wiped out too in the flash flood a couple of days after we made this crossing, but more about that later! After a few hours on the trail with our heavy backpacks, it always feels good to be setting up camp. Go here – http://en.wikipedia.org/wiki/Goat_Rocks_Wilderness – for more information about the Goat Rocks Wilderness.